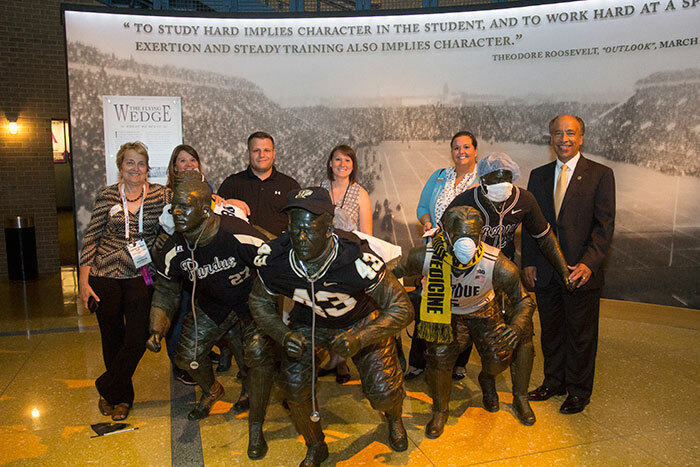 Dean Willie Reed and several PVM alumni pause for a photo-op at a sculpture depicting college football players, who were bedecked in a combination of Purdue and veterinary medical gear for the Purdue Alumni Reception at the NCAA Hall of Champions in Indianapolis. 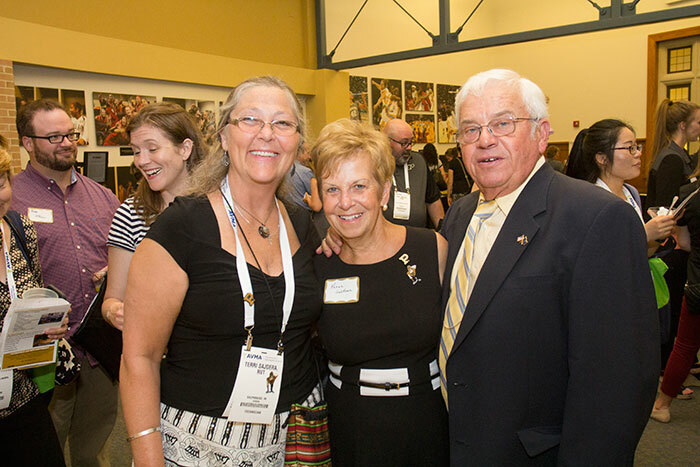 More than 200 Purdue Veterinary Medicine alumni, faculty, staff and students turned out for the Purdue Alumni Reception held at the NCAA Hall of Champions in conjunction with the American Veterinary Medical Association (AVMA) Convention in Indianapolis July 21. 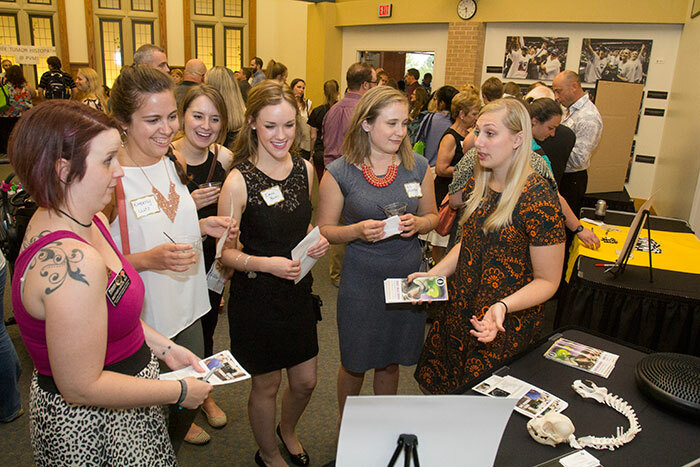 Co-sponsored by the Purdue Veterinary Alumni Association, the event gave the attendees a chance to check-out the beautiful facility and interactive displays, while also enjoying food and fellowship and participating in special activities. 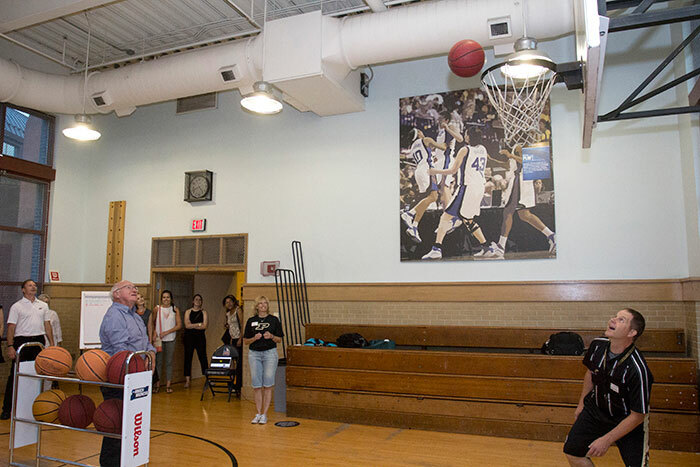 A total of 36 adults and five children competed in a free-throw contest, refereed by Dr. Steve Thompson, clinical associate professor of small animal community practice. Dr. Jonathan Webster (PU DVM 2017) won the adults' division, sinking nine shots total. Current 7th grader and potential future member of the DVM Class of 2031, Anna Brackmann (related to Dr. John Scamahorn of the DVM Class of 1972), took top prize in the youth division. The constant din from talking and laughter attested to the fun times everyone enjoyed at the reception. Guests also heard an update on the College from Dean Willie Reed and explored a variety of booths featuring displays about Veterinary Teaching Hospital specialties and various College programs. Faculty and staff set-up the special displays showcasing such areas as physical rehabilitation, diagnostic imaging, the Centaur Equine Specialty Hospital, Priority 4 Paws, and the Veterinary Technology Program. Veterinary students also raised funds through the sale of PVM clothing and specialty items from the Vet Shoppe. The Indianapolis venue definitely was a hit. Alumni in attendance at the reception represented a wide range of classes, from recent graduates to the most senior alumni. Dr. Steve Thompson, in his role as referee, watches a free throw by alumnus Ed Willard (PU DVM '63) during the Free Throw competition at the Purdue Alumni Reception in the NCAA Hall of Champions in Indianapolis. Dr. Bob Jackman (PU DVM '67) and his wife Karen visit with fellow Purdue Veterinary Medicine graduate (left) Terri Sajdera (PU AS-VT '85). Dr. Jackman helped at the booth for the Centaur Equine Specialty Hospital, which was one of several College exhibits at the Purdue Alumni Reception. 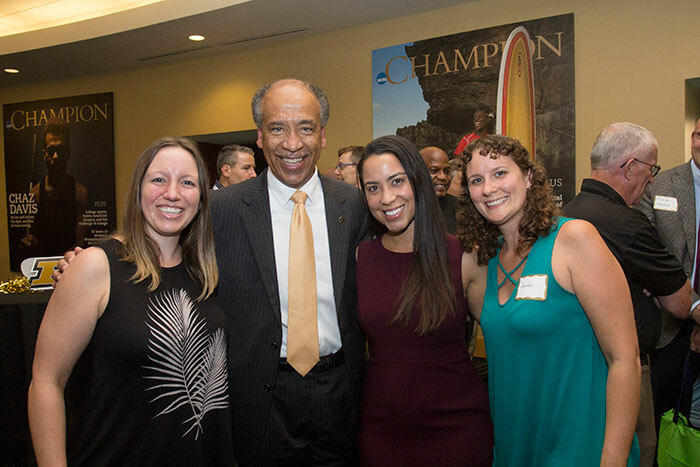 Dean Willie Reed with (left-right) Lara Uriadko, Rachel Cumberbatch and Jennifer DiRenzo, all of the DVM Class of 2011. Brittany Laflen, RVT (far left), small animal surgery/neurology technician, and Jessica Bowditch, RVT (far right), rehabilitation and neurology technician, help at the neurology and physical rehabilitation booth. Attendees who documented that they visited all the College exhibits at the reception were eligible for a prize.